During 2016–2017, Pacific Women funded 14 activities that have a primary focus on women’s leadership and decision making. They account for approximately seven per cent of program funding with five focusing on national-level, two on local-level and five on community-level leadership. Through the activities, 4,049 women were supported to take on leadership roles at community, provincial and national-level. Civic and voter education reached a further 36,426 people. Although progress has been slow, there are some signs of change. While effectiveness is mixed, temporary special measures have been used in the region to increase women’s representation at the sub-national level in the Autonomous Region of Bougainville (Bougainville), Cook Islands, Kiribati, Papua New Guinea, Samoa, Tuvalu and Vanuatu. In 2016, Samoa became the first country in the Pacific to legislate 10 per cent reserved seats for women to promote gender balance in the national legislature. While women are still under-represented in national parliaments, there is a higher participation of women in senior management in the public sector. The regional average has increased from 11.3 per cent in 2012 to 14.8 per cent in 2016. Pacific Women is supporting activities that promote women’s leadership in politics, train women candidates and provide mentoring opportunities for women Members of Parliament (MPs). Pacific Women is also helping to address the broader challenges in leadership and decision making by funding initiatives to increase representation of women and women’s interests. This includes supporting coalitions, such as We Rise, made up of Pacific women and men who contribute to changing social norms about gender roles and encourage women to make their own decisions and advance their own views. The Pacific Feminist Forum, the Fiji Women’s Forum and the Fiji Young Women’s Forum are vibrant spaces for women to exercise and strengthen their leadership skills. Pacific Women’s Parliamentary Partnerships project’s training ‘The Outrigger: Navigating Gender Equality through Pacific Partnerships’ works with all MPs to improve understandings of gender equality and to strengthen leadership by both men and women MPs on gender equality. Support also includes targeted leadership interventions with young women, building their capacity and providing mentoring support. The Bougainville Women’s Federation and the International Women’s Development Agency continue to work together to build young women’s confidence, and knowledge of public speaking and networking, to advocate for their interests. 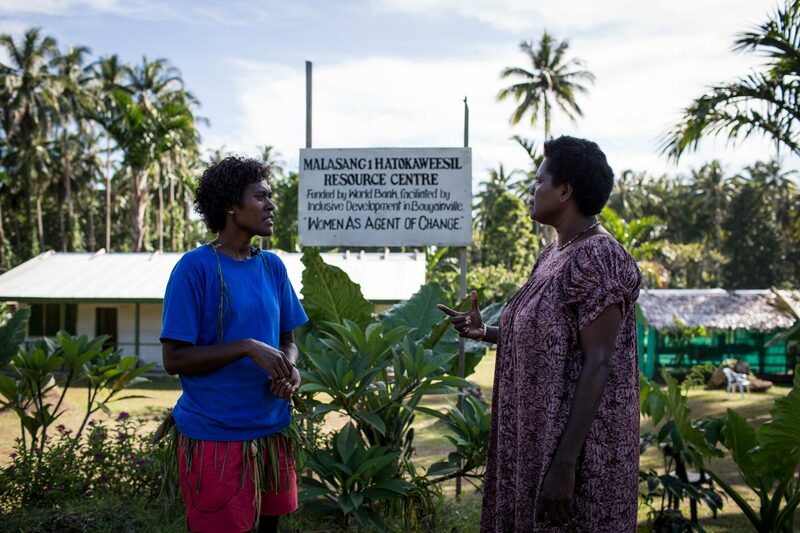 Through projects like World Vision’s Channels of Hope in Solomon Islands, Pacific Women is ensuring more women are visible and influence decision making processes in relation to ending violence against women. The project encourages women community leaders to join trainings and workshops, which has resulted in an increase of women becoming community facilitators and members of World Vision’s Community Hope Action Teams. Pacific Women is also responding to research and lessons learned. Gaps identified during research and prior programming in the region resulted in the design of the Women’s Leadership Program in Papua New Guinea. This design was informed by research findings on ‘Improving women’s leadership, political participation and decision making in the Pacific’, undertaken by the State, Society and Governance in Melanesia program at the Australian National University. The Three-Year Evaluation5 and development of the Roadmap6 and Women in Leadership synthesis report provided valuable insights on effective approaches to enabling women’s leadership and decision making. While good progress has been made in generating knowledge and understanding, gaps remain, and a stronger emphasis on applying lessons learned from past and current activities and research investments is needed to inform new approaches. This includes more coordinated action to address the intersecting elements of agency, power relations and structural change. The case studies that follow demonstrate how initiatives at the regional and community-level contribute to improved women’s leadership and decision making in the Pacific. 5The Three-Year Evaluation report and management response is available on the Pacific Women website under Key Pacific Women resources: www.pacificwomen.org. 6The Roadmap and related synthesis reports are available on the Pacific Women website under Key Pacific Women resources: www.pacificwomen.org. Two key Tongan civil society leaders and members of the Women in Leadership Coalition are Ms Ofa Guttenbeil-Likiliki, Director of the Women and Children Crisis Centre and Ms Betty Blake, President of Ma’a Fafine mo e Famili (translated as For Women and Family). Recognising the pivotal role that leadership plays in development, Pacific Women supported Ms Guttenbeil-Likiliki and Ms Blake to participate in the adaptive leadership training program, part of the Pacific Regional Leadership Initiative. The Pacific Regional Leadership Initiative was developed by the Pacific Leadership Program using the adaptive leadership framework. Adaptive leadership teaches the practice of mobilising people to tackle tough challenges and thrive. The initiative consists of a formal 12-month leadership development program, strategic coaching in addressing practical challenges in everyday work and a train-the-trainer component for selected participants. Through these activities, Pacific leaders are also supported to progress their own initiatives, build a support base, work more strategically and collaboratively and learn to overcome barriers to change. 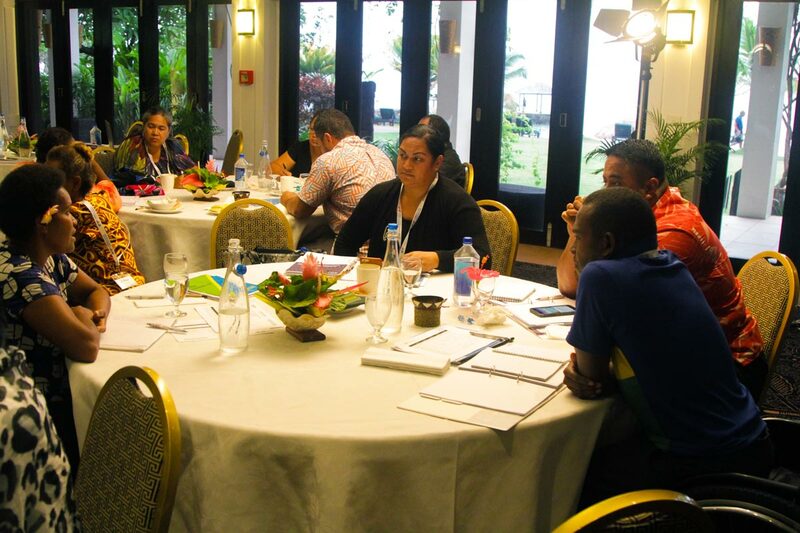 Ms Guttenbeil-Likiliki also applied her train-the-trainer capabilities learned through participation in the Pacific Regional Leadership Initiative to facilitate a two-day adaptive leadership training session in February 2017. Representatives from the Tupou Tertiary Institute, Tonga’s Women and Children Crisis Centre, Civil Society Forum of Tonga, Tonga National Youth Congress and National Disabled Person’s Organisation of Tonga attended. Through participation in this regional initiative, Ms Guttenbeil-Likiliki and Ms Blake have been encouraged to think creatively and take informed risks. They are shaping and leading constructive change in their home country of Tonga. In Bougainville, women are changing community perceptions of the role of women as leaders by leading local infrastructure projects and using this experience as a springboard to other leadership positions. 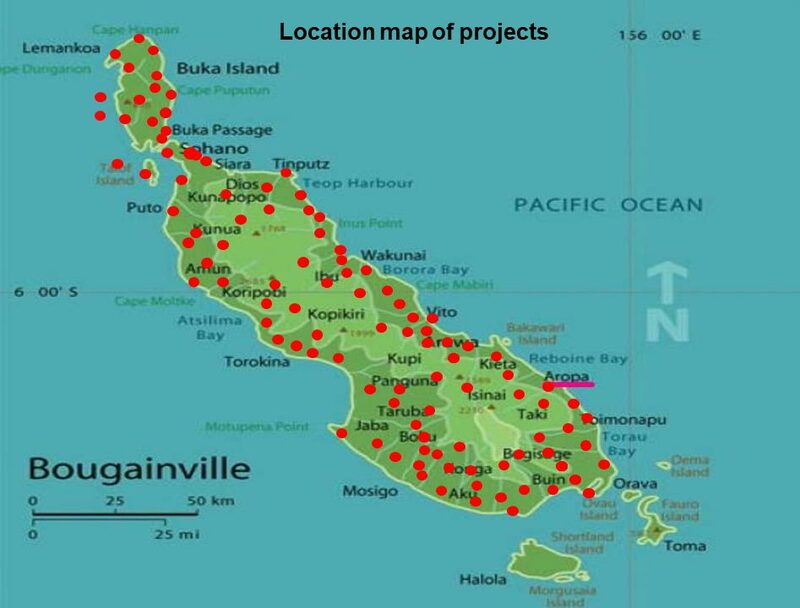 This map shows the location of projects funded through the Inclusive Development in post-conflict Bougainville project. Photo: Severina Betitis, Inclusive Development. The World Bank’s Inclusive Development in post-conflict Bougainville project (Inclusive Development) is implemented through the Department of Community Development. Women’s groups are trained in participatory planning and management and then prepare proposals for community projects, which require a 10 per cent in-kind contribution. Successful projects are funded through a grants scheme. Grants have been used to build water supply and sanitation systems, community resource centres, classrooms, aid posts and feeder roads. Grants have also supported awareness and literacy on village birth attendance, tailoring, and arts and crafts skills training. These community development projects are being delivered by 126 women’s groups across all 43 Community Government areas. The resource centre built in Malasang 1 has had a transformative impact. The centre generates income for shareholders through rent and by supporting local income generation schemes. It is a hub for meetings and provides transit accommodation. It is used as a venue for women’s capacity building events and for fund raising for community needs and school fees. The centre has a positive ripple effect. Individual women have benefited from new networks, skills and income generation allowing them to pay for their children’s school fees. Increased confidence of women and demonstrated competence has led to them taking on more leadership roles within their communities. The centre has also increased community networking and income generation. With membership rising to 3,000, an extension is being built to include a kitchen and dining area to raise even more revenue. If not already affiliated, grant recipients are linked with the Bougainville Women’s Federation, which operates initiatives to advocate for and support women. This has led to a large increase in the organisation’s rural membership. Women at Malasang 1 resource centre. Photo: Conor Ashleigh, World Bank. The project facilitates Department of Community Development officers’ delivery of awareness on human rights issues and gender-based violence. Women human rights defenders, trained by the Nazareth Centre for Rehabilitation and involved in the Inclusive Development project, also share their knowledge on gender-based violence, human rights, and peace and conflict resolution with women participating in project trainings. Increased awareness and growing confidence is helping women to work towards making their communities safer for women and children. Leadership of these community projects is also opening pathways to political leadership. In 2017, community-level elections were held. Under new legislation, each ward is now represented by one woman and one man. Successful women candidates included 17 Inclusive Development project executives and 34 women human rights defenders trained by the Nazareth Centre for Rehabilitation.